Fashion labels face a significant challenge when it comes to delivering an integrated customer experience and brand engagement strategy. On the one hand, fashion can achieve an emotional link with consumers unique to other types of goods and services; on the other, such labels can be limited in how they can directly interact with customers because of the nature of retail and distribution. Le coq sportif, an exclusive sports and lifestyle fashion label originating out of Europe, was facing this challenge when it decided to invest in an ecommerce platform in Australia. An international first, the ecommerce project was designed to offer local consumers unprecedented access to its latest and expanding collections online, as well as take better control of its brand presence nationally. Brand manager for le coq sportif, Charles Hurtebize, told CMO the impetus for its decision to invest in an ecommerce offering was driving by its limited distribution options across the country. Previously, its flagship Sydney store was the only place customers could shop the widest product offering locally. The project took six months to implement from initial planning and conception to launch. Because of the importance of having a local favour to the portal and seasonal variations in stock, work was undertaken in Australia, and under the direction of the company’s international headquarters. Website development consultancy, Net Starter, was recruited to implement the website, and le coq sportif invested in the open source ecommerce platform, Magento, and Magento Community to ensure a smooth transition, Hurtebize said. In addition, the company has teamed up with the Glue Store ecommerce platform to assist with project management as well as the day-to-day management of the website. 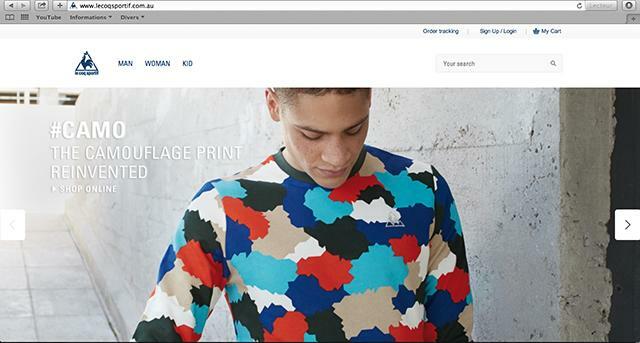 Products are the central focus of the new lo coq sportif ecommerce website. “In support of this, le coq sportif Australia has given customers greater visibility of each product including a 360-degree product viewing platform as well as Free Express shipping,” Hurtesize said. Content is another vital aspect, and le coq sportif has also begun building a local community on social media via Facebook to help drive further direct consumer interaction with its brand. “By providing customers with direct access to the entire range of le coq sportif products in Australia, as well as news and brand content, we aim to increase engagement and direct interaction with customers,” he said. According to Hurtebize, the company is looking to achieve a similar sales turnover to that of its bricks and mortar store in the first year of the new ecommerce platform, and be profitable from the first year.